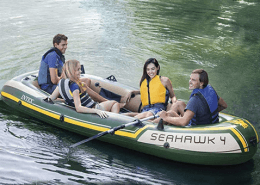 Whether you like kayaking for fun or you’re an avid angler who chooses to fish from a kayak over shore fishing or from a larger boat, you’ll need to have the ability to get your fishing kayak from location to location. This is where a roof rack comes into play. A kayak roof rack allows you to easily and effectively transport your kayak by simply placing it atop the roof of your vehicle. Generally speaking these roof racks are lightweight and easy to both set up and use. They’re very well protected with padding which both protects your kayak and the roof of your vehicle from rubbing or scraping. 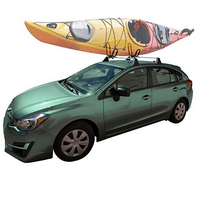 Depending on the size of your vehicle the hardest part of using a kayak roof rack is actually getting the kayak on top of the vehicle depending on your size and the height of your vehicle. Overall, if you’re an avid angler or just a weekend kayak enthusiast having a roof rack will greatly increase your ability to transport your kayak both easily and safely. If you’re on the market for a vehicle roof rack that can carry your kayak, you’ve come to the right place. Here are our picks of the best kayak roof racks for the money in 2019. 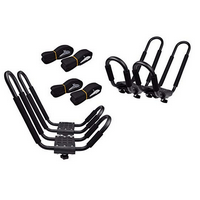 This four piece kayak rack from Leader accessories is designed to be an all purpose roof rack and you can use it to carry not only a kayak or a canoe, but also a surf board, snow board or SUP. 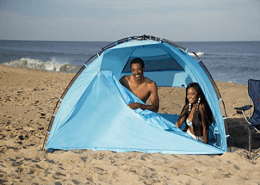 It is designed to help you save cargo space as well as keeping your kayak safe during a long trip. It has a steel construction with a power coating that not only makes the rack stronger, but also resistant to rust. This is especially useful if you go sea kayaking as the saltwater can quickly corrode some types of roof rack. It will lock your kayak tightly and can carry a boat up to 8ft long and has been tested on 250lb of weight. 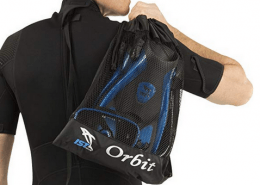 It has an extra foam padded design that will reduce the possibility of any scratching to your kayak or canoe and prevent rubbing. Not only this, but it comes with four extra ratchet straps to tie down your boat securely. Its a great little double kayak roof rack. The assembly instructions on this roof rack do take a while to figure out, however it’s important to get to grips with them so that you can mount your kayak correctly. There is also no rubber padding on the bottom shelf bracket and these have the potential to hit your car so you may want to add on your own. Overall, this roof rack is sturdy made and inexpensive. The Yakima Jaylow kayak carrier Is made to support a boat of up to 80lb, or two boats where their combined weight is less than 110lbs. It holds the single boat in the J-Cradle position, and two boats in vertical, stacker position. One of the great feature about this boat rack is that it folds down when it’s not in use. This creates better aerodynamics and allows for clearance into a garage. The rack has durable padded contact points for protection and grip. As well as this, a soft, over-molded base with grooves cushions the boat. This also allows all sand and grit to wash away. The rack includes heavy duty straps and tie downs that have an integrated bottle opener. The straps can be locked to the base rack, however one downside is that unfortunately this locks are not included and must be bought separately, this is one of the best kayak racks for SUV’s. This isn’t the most sturdy of racks, and is much better for carrying one boat rather than two. It does tend to wear after a shorter amount of time than expected however it is a good price so if you don’t travel frequently, this roof rack is for you. The newly designed OxGord Roof-top Canoe Carrier mount is designed to be easily set up on a car, SUV, truck or van, and just as easy to remove again. It is 20” x 5.5 x 16”, which may not be suitable for fishing kayaks, so do check the dimensions that these hold. 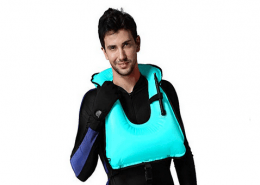 It has carrier straps, padded J-cradles as well as bowstern straps to provide safe transportation of your kayak or canoe. It is lightweight and made from water-resistant steel to protect your vehicle during transit. 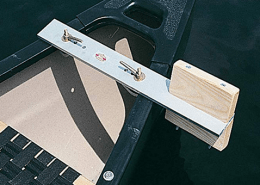 The additional carrier stand straps keeps your kayak safely secured. 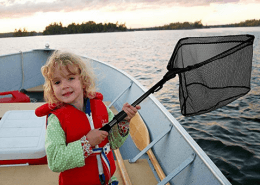 The J-bars of this canoe carrier are sturdy and good quality. The tension knobs on the bottom part of the J-bars can come loose after a while due to the vibrations of the moving car so it is important that these are checked regularly. A quick fix for this is to put a nylon lock nut on them to prevent this loosening. This are inexpensive racks, however they may be prone to rustling as they are not saltwater resistant. This may be a problem for those of you who are out and about regularly and fishing on saltwater, as you ma find that these racks don’t stand the test of time. 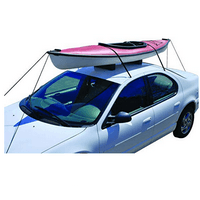 This is an amazing kayak roof rack for cars. This rack is different because it isn’t actually a roof rack in the traditional sense. The Attwood comes with supporting foam blocks, two straps with adjusting buckles and clips as will as 15 feet of polypropylene rope. This does away with the need to have a dedicated kayak carrier strapped to your car’s roof, Instead, this kit provides you with everything that is needed for safe and easy transportation. Once it’s been used, it then can be quickly removed from your car roof and stored away. It way be a good idea to buy extra straps when using this. While the straps includes are made of a sturdy poly-web with vinyl-coated clips, these are to be used to run through the slits along the bottom of each rubber block to fasten each block to your vehicle. This means that you will need another strap to go across your actual kayak. There is the chance that it will scratch the roof of your car a little if they are not secured correctly, so do make sure and test this out before going on your first long journey when using it. This is one of the best kayak roof rack for cars without rails. 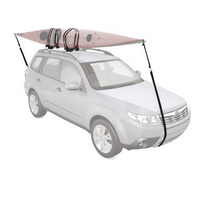 This Kayak carrier from TMS is designed to be mounted on almost all crossbars. The carrier secures the kayak on its side, taking up little space. You can also put the rack on a Ladder Rack Bar however this is sold separately form the manufacturer. 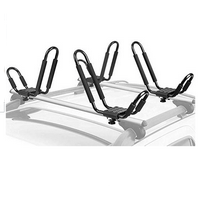 If you have a truck, then a maximum of four sets of these racks can be mounted onto the roof. It is important to double check your measurements as this rack isn’t suitable for all vehicles. 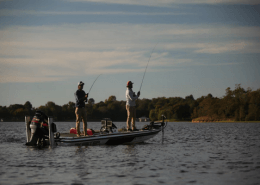 It has a steel design with adjustable padding for extra carrying strength as well as kayak protection and you’ll also have the ability to leave your kayak fish finder and kayak trolling motor on the kayak while in transport. The wide mouth J bar provides much easier loading and unloading for you to install and remove within minutes. 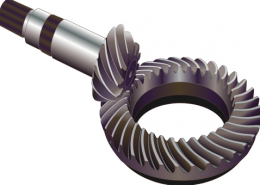 The tool provided means that it may take longer initially, but using a ratchet wrench will significantly speed this up. 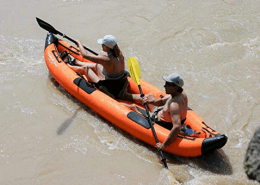 All of the surfaces are rust resistant and the two straps will accommodate kayaks up to 36” wide and 75lb”. Some feel that the straps aren’t as secure as some other models, however for the price they are sufficient for shorter journeys. If you are travelling a long way on the highway then it’s recommended that sturdier straps are purchased.